Thanksgiving is just around the corner. It's time to celebrate life and give thanks to all the people around us that made a difference in our lives. 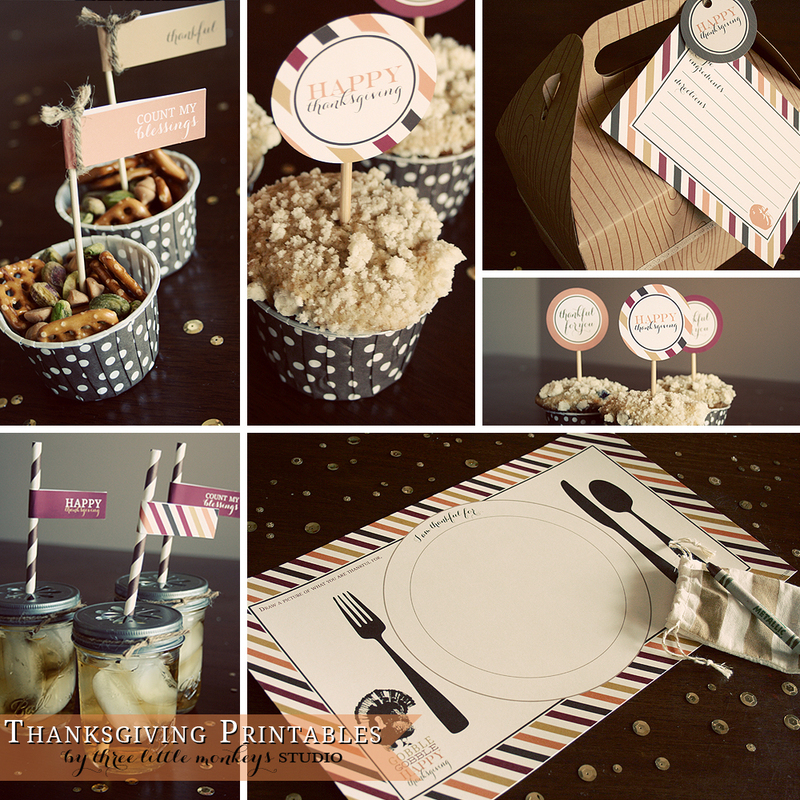 Whether it's a large Thanksgiving feast with many families and extended families or a smaller gathering of immediate family, it's always fun and festive to add some autumn Thanksgiving decor touches to complement the lovely dishes that will be served. Cork mats not only help preventing the hot plates and pans from burning the table, its medium brown rustic color is perfect for the autumn decor look. Either purchase them in already Thanksgiving themed pre-cut shapes like turkeys, pumpkins, or leaves, or one can very easily make them at home. For people who love to DIY, search for a leaf or turkey picture that you like online, enlarge or reduce the picture into the size you like the mat to be in, print out a copy, and trace the outline of the leaf or turkey with a thick black marker. After placing the outlined picture on top of the cork mats, use a sharp blade to cut through both the outline paper and cork mat. Clean up the edges with a sharp scissor. 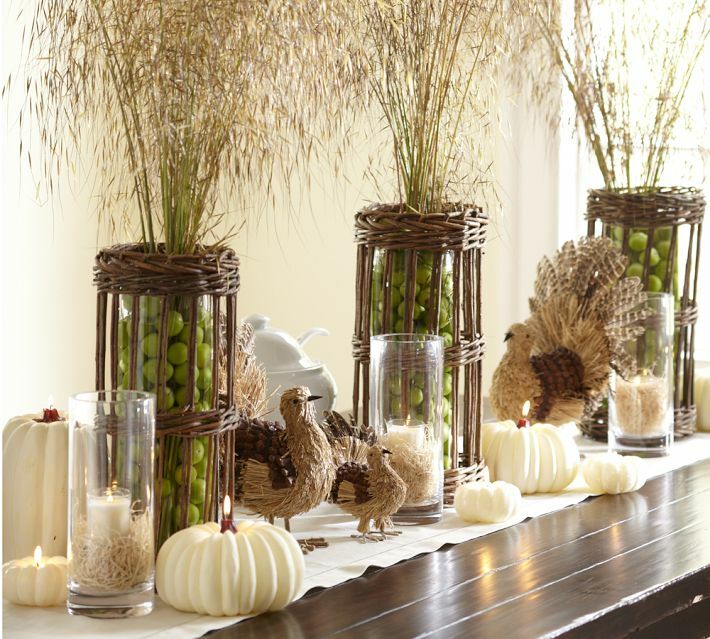 Filling large vases with fresh fruit and candles is an organic and wholesome way to decorate. Fruits that are bright in color, firm, and round in shape are great choices, such as green apples, lemons, limes, and oranges. Candles in vases add warmth and a nice glow to the atmosphere. For a more formal gathering, placing tags and flags is a charming way to personalize your message and the occasion. The flags can be placed in little hors d'oeuvres ramekins, in cheeses, fuits, cupcakes, or desserts. To create a more engaging visual display, adding height to a decor creates a focus point. An easy way to achieve this is to stack two cake stands over another plate, and fill each layer with breads, fruits, cheeses, or desserts. This may not sound so appetizing, but they are visually very pretty. Wrap large candles with fresh garden vegetables such as asparagus, artichokes, brocollinis, or green beans, and secure them in place with a nice mustard color ribbon. The vegetables will look cohesive together as they are from same color family; their different heights and textures will layer each other to create a nice effect. 6. Edible Fruit as Place Holder Decor. A pretty piece of fruit, like pear, apple, or pomegranate with a handwritten tag pinned or tied with ribbons as place holders is a chic way to decorate the plates. Let's not forget to decorate the mantels or fireplaces. Hang a "Give" banner over one giant or two medium sized picture frames with some dried flowers or plants in vase, and place a few painted pumpkins with the word "Thanks". Love this Martha Stewart's pumpkin painted in gold as place holder idea. The gold adds glamour and refinement and very complementary to the golds and browns fall colors. Wish you all a very heartwarming and festive Thanksgiving!